Stewart, Lori. If I Had as Many Grandchildren As You… (published in 2011 by Palmar Press, P. O. Box 6444, Carmel, CA 93921). If you are a grandparent, how many grandchildren do you have? If you’re not, how many grandkids do your grandparents have? Did you know that there reported to be between sixty and eighty million grandparents currently in the United States? As this book opens, a grandparent is besieged by “a gaggle of grandchildren.” A plan for adventure and fun for them had been promised, but none had yet been thought of. All of a sudden, a huge lion in a red baseball cap appears in the garden. Named “Grand Paws,” he offers some sage advice on the things he’d like to do, places he’d like to go, sites he’d like to see, and lessons he’d like to teach, “if I had as many grandchildren as you.” What kind of fun activities can you imagine that kids and their grandparents might do? 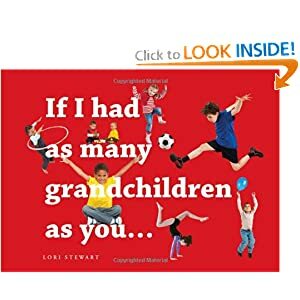 Author Lori Stewart uses highly inventive and catchy rhyme to tell this warm-hearted story that grandparents will enjoy reading aloud to their grandchildren. If I had as many grandchildren as you! In addition, there are 41 luscious, color photographs to illustrate what Grand Paws says. Have you ever seen a “circumzenithal arc”—in other words, an upside-down rainbow—caused by sunlight hitting hexagonal ice crystals? Did you even imagine such a thing to be possible? If I Had as Many Grandchildren as You would make a perfect gift for children to give to their grandparents, and for anyone to give to somebody who is or is about to become a grandparent. This entry was posted in childrens books. Bookmark the permalink.